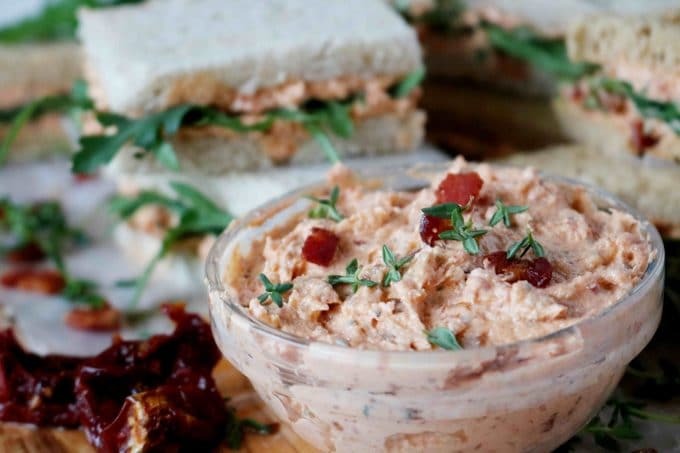 An easy sun-dried tomato spread that comes together quickly in a food processor, featuring sun-dried tomatoes, bacon, and fresh thyme. 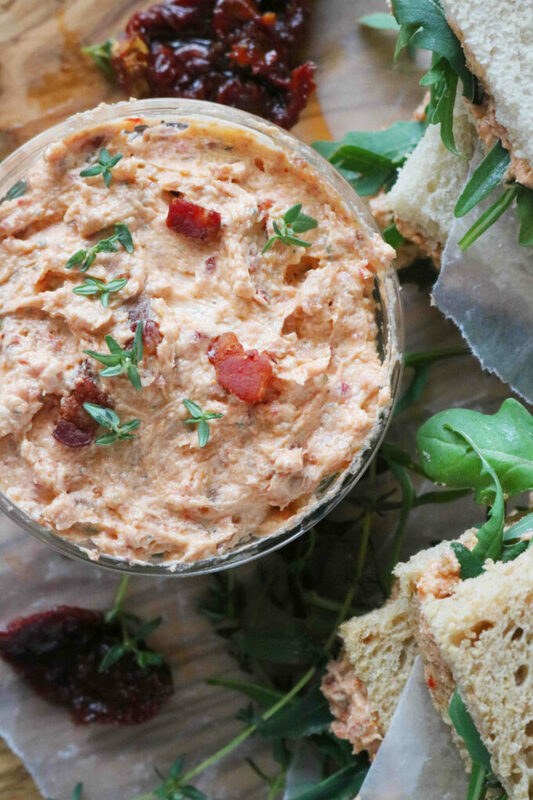 If hosting parties runs in your DNA, you’ll need this Sun-Dried Tomato Spread in your recipe arsenal. 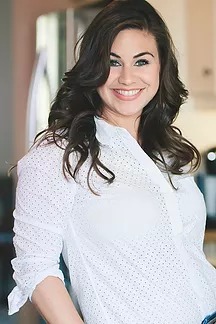 Hosting happens to be my happy place as well, and when it comes to baby showers I am usually chomping at the bit to create a menu. In fact, baby showers just might be one of my favorite events of all. First of all, baby shower food is typically dainty and somewhat girly (yes, please), there’s tons of girl talk, and then there are the teeny tiny baby clothes. What’s not to love about that? A few years back, I hosted a shower for a good friend of mine. I wanted her baby shower menu to be sweet and tasteful, light and lovely, and all the things that a group of women would go crazy over. We had Goat Cheese Canapés topped with honey and walnuts and beautiful jam-filled Strawberry Thumbprint Cookies. 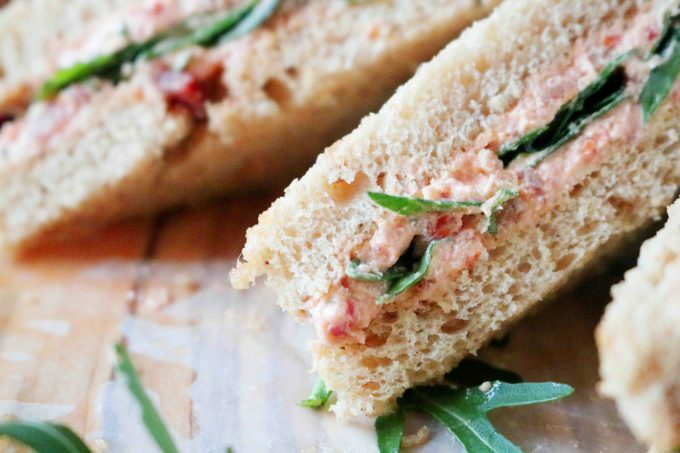 Guests loved the creamy salmon Lox Spread between thin slices of Rye and cut into little tea sandwiches, but maybe the biggest hit at this shower was my newest creation, Sun-Dried Tomato Spread with Bacon, turned into charming little tea sandwiches. Tea sandwiches are one of my favorite items to serve up at any event I’m hosting, because more times than not, the heavy lifting can all be done in advance. 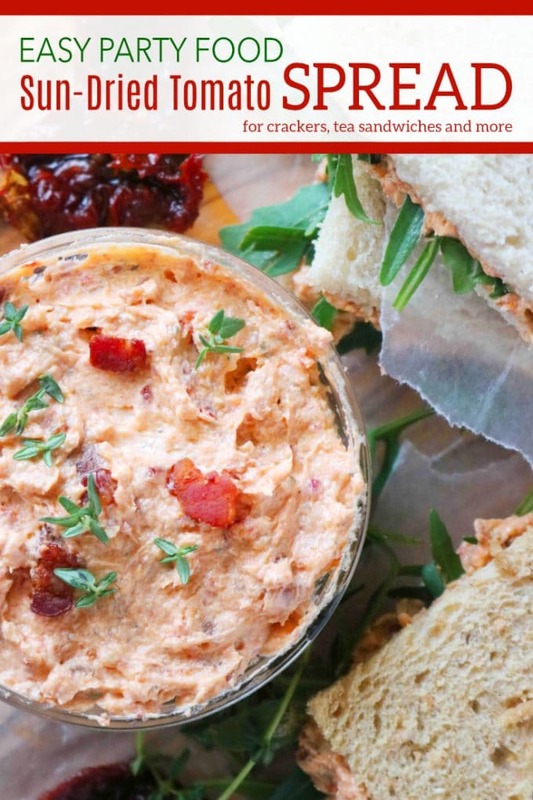 This is absolutely true for this Sun Dried Tomato Spread with Bacon. You just whip it up 2-3 in advance and keep it refrigerated until the big day. The inspiration for this spread started with the B.L.T., a sandwich so glorious, nobody could deny its savory allure. I wanted all those B.L.T. components to be present in a spread that could easily be made into a tea sandwich. The only trouble? Tomatoes have far too high of a water content for tea sandwiches. The bread would be soggy long before the sandwich ever got a chance to be eaten. Therefore, sun-dried tomatoes were the perfect substitution. When the spread comes together, it’s unbelievably flavorful, speckled with bits of salty, savory bacon, with bursts of sweet acidity from the sun-dried tomatoes, and it’s all held together by a creamy, savory cream cheese mixture. In a word, it’s divine. To make the sun-dried tomato spread, you’ll start with diced, thick-cut bacon and fry until crispy. Then, room temperature cream cheese, mayonnaise, fresh garlic, and spices all go into the bowl of a food processor and are processed until smooth. Then, in goes the bacon along with sun-dried tomatoes, and the mixture is pulsed just until the tomatoes and the bacon are incorporated. That’s all there is to it. Homemade doesn’t get a whole lot easier than that. 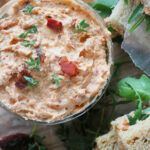 This sun-dried tomato spread is a bona fide party hit, and one all of the women raved over at the shower. But, the goodness doesn’t stop there. Spread it over a slice of toasty baguette, let some baby arugula fall across the top, and you’ve got an easy, yet elegant, appetizer perfect for any cocktail or dinner party. It would also make a delectable dip for a hearty cracker or chip. Please, enjoy! Allow a large skillet to come to temperature over medium-high heat. Add the bacon and cook for about 8 minutes (or until crispy), stirring often. Transfer to a plate lined with paper towels and set aside to cool. Add the cream cheese, mayonnaise, butter, pepper, and salt to the bowl of a food processor fitted with a blade attachment. Process until smooth. Add the sun-dried tomatoes, garlic, thyme, and half of the cooked bacon and process once more. Transfer the spread to a bowl, and stir in the remaining bacon. Serve and enjoy. The cream cheese and butter must be at room temperature for a smooth spread. My family would go crazy for this spread! I bet the flavors taste amazing together. I want to try this with cherry tomatoes from my farm share. This dip would be perfect for any dinner party or get together. Absolutely perfect for a party of even a snack at home! So good!!! Such a tasty spread and perfect for summer nights! I like where your head is at, Cindy! Thank you! What a great party dip! This is sure to be a hit!